Richard Feather Anderson, B.Sc. Architecture, is an internationally recognized pioneer in the revival of feng shui, geomancy, sacred geometry, and labyrinths. He started one of the first geomancy training programs in America in 1985, and has been designated a feng shui master by feng shui Institute International. Richard was feng shui advisor for Esalen Institute's sustainability plan, and design consultant for Grace Cathedral's labyrinths in San Francisco, the first permanent replicas of the Chartres Cathedral labyrinth in an American church. 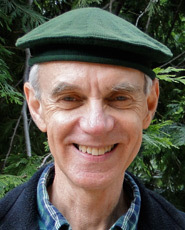 Richard teaches at the Globe Sound & Consciousness Institute in San Francisco, and previously taught in the EcoDwelling program at New College of California, and led sacred geometry tours at Chartres Cathedral in France. Introduced to geomantic wisdom in childhood, he continued his studies in feng shui with Grandmaster Lin Yun, Rinpoche; in sacred architecture with Dr. Keith Critchlow, Professor Emeritus of the Prince of Wales Institute of Architecture; and in Earth Mysteries with the world's leading experts. Through workshops, feng shui consultations, and building designs, Richard continually creates modern applications for ancient wisdom, and is well-known for generously sharing his knowledge in an experiential way with passion and humor.